Last month, you may have read about me talking about Nano's on my writing blog here. I guess you could say that today's project is one of those nano's - something I've meant to do and have over looked or forgotten. Like making this shirt. Believe it or not, I bought this pattern and the fabric back in the B.C. age (Before Children). Instead of buying a new outfit for the wearing out for Holiday parties and Christmas Eve services, I decided it was time to finish this project - or I guess I'd have to start it first. So I cut it out, careful to make sure I got my measurements right. Then started the task of sewing it together. I added some trim I found stashed in one of my sewing drawers. It's not very festive with it being brown, but I thought it looked nice for wearing in the fall time, too. I can get more wear out of it this way. 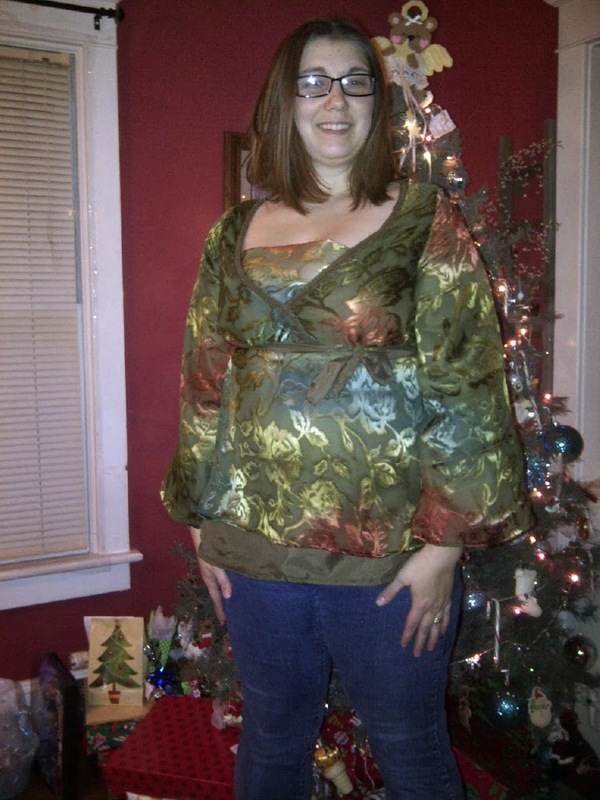 And after five hours of measuring, cutting, and sewing... one festive holiday shirt for the wearing. Once I got it on, I realized this shirt style was a little too low cut for my personal preference, so I added an extra piece across the bust. As I hoped to wear it this evening to Christmas Eve services at our church, it doesn't look like we're going to make it this year. :( Mr. Chad T. got home from work late and Grandma Linda's car broke down. So the kids and I had a wonderful talk about Christmas and the celebration of Jesus's birth before I tucked them into bed. In the morning, not only will Santa have come, but Grandma Linda will have arrived as well. As you all prepare for your traditional Christmas Eve gatherings and bedtime routines, I want to thank you for hanging out with me this month through the Twelve days of Christmas and wish you all a blessed Christmas day. I hope you continue to come back and join me through 2014, too.